We discovered many fun things to do in Marietta, Georgia! This city has incredible history as well as hip new attractions and restaurants. We recently had some free time between two house sits in Atlanta so we decided to head just north of the city and check out Marietta. 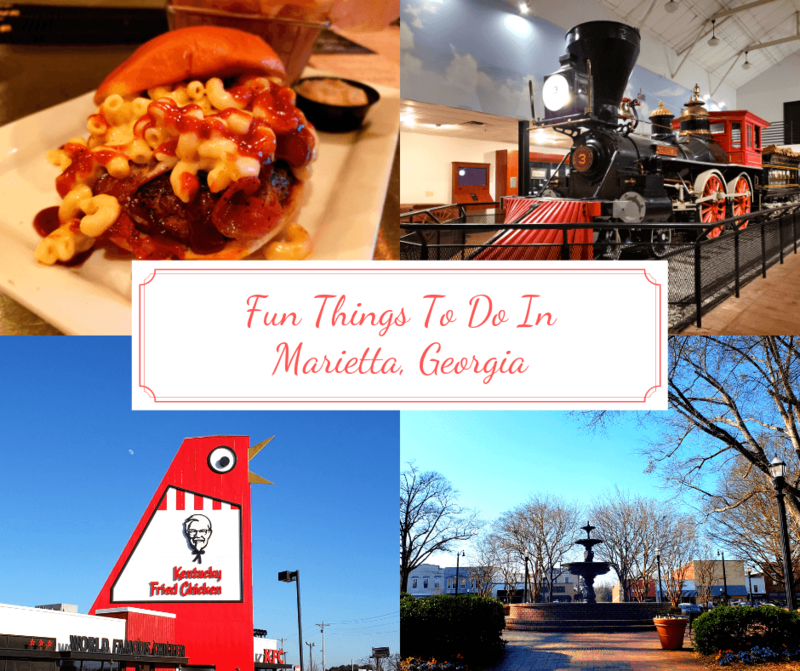 We hadn’t done much research ahead of time, so we stopped by their Visitors Center and realized there were a lot of fun things to do in Marietta! Over the next few days, we visited historic sites, museums, and ate a lot of amazing food. When visiting Marietta, we think your first stop should be the Marietta Museum of History. It’s a great way to learn about the area and to orient yourself, so to speak, when going on to visit other Marietta attractions. They also have a lot of military artifacts, which we really enjoyed. The Homelife Gallery has antiques and artifacts that were popular in everyday life during the 19th and 20th Centuries. The Military Gallery has uniforms, guns, artifacts, and highlights local military members. Looking for free things to do in Marietta? Stop by the Marietta Fire Department Museum. Inside, you’ll find two floors of awesome antique fire apparatuses, tools, and gear dating back to 1854. You can do a self-guided tour to learn about how the Marietta fire department has changed over the years, or you can schedule a guided tour (they need at least a week’s notice). Buddy really enjoyed the museum! Fun Fact: If you’re into fire museums, the Pennsylvania National Fire Museum in Harrisburg is pretty awesome! We loved the Gone with the Wind Museum! There are so many fascinating pieces in their collection, including an original dress worn by Vivien Leigh as Scarlett O’Hara in the movie. There are also copies of the book signed by Margaret Mitchell, promotional pieces including foreign film posters and premiere programs, and more! The William Root House Museum is the oldest surviving house in downtown Marietta and, in our opinion, one of the top things to do in Marietta. The house offers a glimpse into the life of a typical merchant in the 1840s. A lot of effort was put into restoring the home and it is decorated in period furniture. When we visited, John showed us around the house and gardens and told us all about the history of the Root family. He was very knowledgeable and pointed out a lot of interesting artifacts. We especially loved the modern touch-screen display that broke down the history of the family and the house. We tinkered with that for awhile after our tour was done. One of the bedrooms. At one point 11 people lived in this house! We loved the working 1850s cookstove in the outside kitchen! The Marietta/Cobb Museum of Art is an American Art museum with rotating exhibits and year round events. During our visit we saw work by Richard Cecil on the first floor and work by Carole Pigott on the second floor. Of course, the heart and soul of the city can be found in Historic Marietta Square. Many Marietta events are held on the square throughout the year, and all around it are over 70 shops, restaurants, and entertainment venues. The square itself is also very pretty and a nice place to sit and people watch. We weren’t expecting to find street art in Marietta, but guess what? We did! There are a few pieces throughout town, one of our favorites being a giant chick lol! We also found some chalk pieces left over from Chalktoberfest 2018, which were pretty awesome. We didn’t know about The Big Chicken until we got to Marietta, but it’s a pretty big deal! This 56 foot tall chicken is located at the intersection of Cobb Parkway and Roswell Road, the biggest intersection in Marietta, and it’s beak and eyes move. No wonder it’s such an important and iconic city landmark! The museum also does a really great job of explaining how the Civil War was the first major military conflict were trains played a huge role due to the fact that they provided food and supplies to both sides. We didn’t get a chance to visit the park because of the weather, but we were told it’s worth a visit. The park is is a 2,965 acre National Battlefield that preserves a Civil War battle that occurred in June of 1864. You can take a self-guided driving tour, or enjoy many of the park’s hiking trails. The views from the top of Kennesaw Mountain are supposed to be pretty spectacular. We briefly mentioned Marietta Square already, but we wanted to tell you a bit more about some of the Marietta Square restaurants. Because they are yummy!! No surprise, but we had to try out Marietta Pizza Co. With a fun and casual atmosphere, we enjoyed a Caprese Salad as well as two slices of pizza. We probably should have ordered only one slice, as they were a bit bigger than we expected, but they were so good that we managed to eat both lol! Who doesn’t love a good food fusion?? At Taqueria Tsunami, they blend flavors from the Far East with flavors from South of the Border to make dishes that will blow you away. For an appetizer we had the Avocado Cilantro Egg Rolls and they were phenomenal! For our main meal we chose an Asada Zing Taco and a Shrimp Tempura Taco. The Asada Zing had Korean Bulgogi marinated steak topped with shitake mushrooms, lettuce, soy-sesame vinaigrette and sesame seeds. The Shrimp Tempura had shrimp tempura topped with Asian slaw, fresh cilantro and a hoisin-lime aioli. It’s hard to say which we liked more, because they were both so good! Make sure you arrive hungry to Stockyard Burgers & Bones! There are a lot of great options on their menu, but when we saw the “Dirty South” we knew we had to have it. This burger comes with smoked Gouda mac & cheese, bacon, and apple butter BBQ sauce. There were a lot of flavors going on with this burger, and they were all wonderful! Another one of the popular Marietta Square restaurants is Two Birds Taphouse. This self-proclaimed modern-day “Cheers” is definitely a fun place to hang out and get some drinks. They offer mostly local and regional craft beers from Georgia and the Southeast and also make many delicious cocktails. There were a lot more things to do in Marietta than we thought! There’s certainly a lot of history, but also a lot of new and fun shops and restaurants that we really enjoyed. This charming city has a bit of everything! Pro Tip: If you’re planning on heading south as well, here’s how to do Atlanta on a budget! Top St. Augustine Attractions: Chocolate And Wine Tasting! I love the look of the museum Vicky. I can only imagine how good the food is, too. While I like museums as well as the next cultured person, is this the best you could come up with? No mention of the Whitewater water park, or even Six Flags just beyond Marietta in Mableton? The state fair, the Strand, the battlefields? Mountasia, the Anderson theatre, the Performing Arts Center, the Meadery, the Chattahoochee Nature Center ? Come ON ! Too many things to list to to mention a pizza place or the old library. I’m sorry. Hi Sandi, thank you for your comment. Unfortunately we were only in Marietta a few days and some of the things you mentioned weren’t open or going on while we were there. We tried to do as much as we could during a short amount of time. Hopefully we’ll be able to visit some of the places you suggested the next time we visit. I see. However, the only things that would not have been open at this time of year would have been the theme parks, and even those will be open next month. I hope you get a chance to explore further next time. The state fair certainly wasn’t going on either lol. And we actually did visit the Chattahoochee Nature Center, but didn’t mention it here since it’s in Roswell. There are events going on at the fairgrounds consistently through the year. And technically, the Nature Center is in an area that is Marietta on one side and Roswell on the other, so it wouldn’t be as far off as mentioning the General locomotive, which is actually in downtown Kennesaw. I’m not trying to pick a fight here, so please don’t take it that way.I understand that you’re traveling and want to give an impression of things you have seen, but that probably should have been qualified at the beginning of the post. If you seek information from someone who has lived there most their life, however, that would be me…and all I really am trying to offer, if you so desire. I actually did mention right in the beginning of the article that we were in between house sits and spent only a few days in Marietta. As I also mentioned in the article that the General was technically in Kennesaw. And as I mentioned in an earlier comment, we did what we could in the time we had. If you’ve lived there most of your life, you are obviously the expert in the area. Although it certainly took you more than a few days to become that expert. You may not be trying to pick a fight, but it sure seems like it. But thank you for kindly reminding us that we can never please everyone. There’s almost never enough time in a day for me so those museums look like a great way for me to enjoy a day trip thru Marietta and top it off with that burger on my way out. Visiting the civil war era museums is something I always do whenever I’m in the area (Gettysburg, Harper’s Ferry, Fort Sumter are some of my favorite visits). I didn’t realize Marietta was where Andrew’s Raiders stole the train from. It would be cool to see that train in person and imagine those fellas boosting it and hightailing it outta there. If I remember right, those fellas were the first Medal of Honor recipients. I’m curious about the touchscreen display at the Root museum. Is it captioned or subtitled where there’s audio if any? I always go for them but never seen them at smaller museums. They usually help me appreciate my visits a lot more when I can’t follow an audio tour or the tour guide goes “off script” from the paper transcript they provide upon request for deaf and hard of hearing visitors. Great post. You made me think twice now about Marietta because of the General. We also really enjoyed Fort Sumter! So the touch screen display does not have any audio, it’s all text. We were really surprised to see it, considering it is a smaller museum. But it was very innovative and really informative. What a wonderful and thorough list of things to do! Thanks for putting together such a helpful piece about Marietta.